International Campaign for Human Rights in Iran: Imprisoned journalist and Secretary General of Advar Tahkim Vahdat Alumni Association was transferred to a Tehran hospital on Saturday, November 17, after six months of severe illness and repeated requests by his family for his medical treatment. A source close to Ahmad Zeidabadi told the International Campaign for Human Rights in Iran under condition of anonymity, "He has been sick for six months. His problems started with a skin condition and a cold that turned into bronchitis and led to asthma and heart palpitations, and he now has mouth and throat sores. He was sick enough for the prison infirmary physician to order his transfer for treatment outside the prison. But it took about two months to do the administrative work for his transfer." 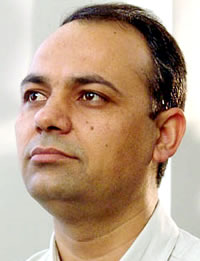 Ahmad Zeidabadi is a prominent Iranian journalist and political activist. Security forces arrested Zeidabadi one day after the disputed 2009 presidential election. He was sentenced to six years in prison at Rajaee Shahr Prison in Karaj, outside Tehran. "The cause of his illnesses has not yet been determined, but the initial diagnosis is that Ahmad is under psychological pressure and stress has led to these illnesses. He has been in prison under stress for 3.5 years, especially the first few months of his detention when he was under immense pressure and the effects are now showing up on Ahmad's body. We will have to wait to see what the physicians' final opinion is," the source told the Campaign. "The Medical Examiner has ordered examinations by an ear, nose, and throat doctor, a digestive track physician, a heart specialist and an internal medicine doctor," the source added. According to the source, the reputable Iranian journalist was foot-cuffed to his hospital bed until noon today (November 20), and his family were not able to visit with him easily. "The family of this prisoner have been severely mistreated since Saturday. They don't have permission to easily visit with Ahmad; they have to sit in the hallway outside Ahmad's door and to see him from a distance. The only time his wife can visit with him in the room is when she is following up on his medical cases. Three forces are consistently present in his room and they even follow him to the bathroom and he shower. Unfortunately, these forces do not know the difference between regular prisoners and political prisoners. When someone like Zeidabadi has posted a 300 million Tooman bail, why should he escape? He has gone on furlough several times and if he wanted to escape, he would have done it during those furlough days, not now, when he is sick and in hospital," the source told the International Campaign for Human Rights in Iran. "He was foot-cuffed to his bed. His wife went to Evin Prison Court today to object, and the Tehran Prosecutor ordered his foot cuffs removed. Mr. Zeidabadi should be away from stress, but such issues exacerbate his stress," concluded the source. Regime change by Iranians for Iranians with logistical help from the sane world is the only way to end 34 years of barbarism at the hands of the Messianic Islamist Rapists, “reformers” and all. He has been ill for a long time and these savages did not allow him to seek treatment .